The Descend is a relatively short fitting, waterproof jacket featuring Regatta's proprietary Isotex 10000 XPT Xtreme technology. Made from a fabric which does certainly have a softer feel to it than the standard Isotex, the fit overall is good and true to size. 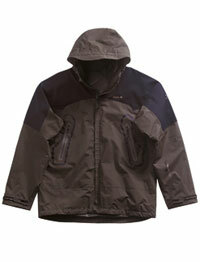 I liked the hood which is detachable, readily adjustable and easy to fasten. Furthermore, when fastened fully, there was a good level of comfortable face protection. There is an interesting selection of pockets. The 2 front side, hand warmer pockets whilst small are readily accessible when wearing a backpack. There is also a small pocket on the left arm which could be useful for items such as keys - however I found this really hard to open when wearing the jacket - which did reduce its usefulness for me. There are also 2 useful zipped pockets on the inside - one of these has an exit point for ear-phones which is a nice touch. At the bottom left hand side, there is an OS map sized, map pocket. A good idea - but I became slightly frustrated by having to open my back-pack belt and then the jacket in order to get at the map.. I've worn the Descend in a some quite cold Autumn weather conditions featuring a lot of wind and rain - it's certainly kept me warm and dry. Weather conditions have not yet allowed me to really test out the breathability of the fabric. However, it was good to see that the jacket does have pit zips which - together with adjustable cuffs do allow some degree of temperature control. The zips on the arm pocket and front handwarmer pockets are waterproof but I did find them a little hard to use. The toggle on the main front zip is a reasonable size but I didn't think it felt very subtstantial. There is a slight stretch at the top of the arms/shoulder areas which added to the freedom of movement.�However, I did find that - because of the jacket's length- it did have a tendency to ride up when I lifted my arms. Whilst a style which is longer is probably better as a dedicated walking jacket, the Regatta Descend has a number of features (such as the pit zips, enhanced shoulder area mobility) which make it worthwhile considering as a mid-price, general multi-activity waterproof jacket. It's also good-looking enough to use for general leisure.